Wadi Shab lies in Niyabat Tiwi, Wilayat of Sur, is 76 km from Qurayyat. It is easy to reach this wadi from the Qurayyat-Sur highway. The wadi combines the attractions of coast areas and inland wonders. It has at least seven pools of shimmering emerald green water studded beautiful boulders. One of the pools is in a cave where light streams in dramatically from above and there are fantastic echoes as you swim and splash. 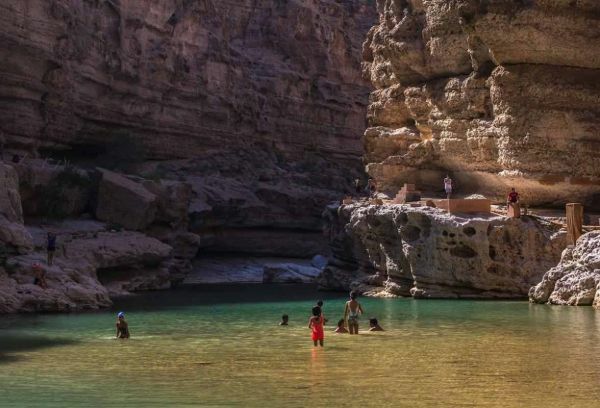 This wadi is arguably one of the most gorgeous destinations in Oman. Beyond the breathtaking entrance, the wadi rewards you with views of aquamarine pools, waterfalls and terraced plantations; kingfishers add glorious splashes of colour. For the adventurous, there are plenty of opportunities for (discreet) swimming and a visit to a partially submerged cave. The main attraction of the wadi is the water fall in the cave, which you can reach after a roughly 40 mins hike and swimming in 2-3 pools. I really love coming to this wadi as it is not very far from Muscat, is easily accessible even with a saloon car and because the pools are always full with clear blue water! It is a unique environmental system characterised by variety, diversity, and a wealth of natural attractions. Within this fertile environment, people have lived in the wadis (valleys) of Oman for thousands of years. About seven kilometers away from Wadi Shab starts Wadi Tiwi which extends 36 km inland and ends at a mountain village known as Mibam. Many groves and fruit trees grow along the course of this wadi from which the azure blue sea can be seen as you climb up the hills and descend into the valleys.